The project is a solution for sparsely populated rural areas unable to attract market-based broadband operators. It raised awareness on how villagers can set up "village nets" that are then financially viable for providers to hook into and service. Well developed broadband infrastructure helps create conditions for vibrant rural areas. The need for broadband is increasing in society, but in rural areas the lack of broadband infrastructure is a major problem. Broadband operators are largely interested in investing in areas where the density of customers is high. This project is doing something to change the situation, by mobilising village residents and broadband service providers through joint collaboration. 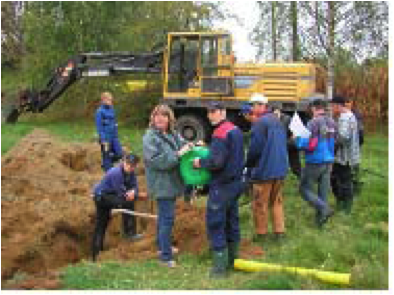 The idea is to raise awareness in rural village communities about the possibilities for connecting homes with their own internal broadband networks (or "village nets"). Having reached this stage, they would then be "handover points", enticing for network operators to connect to the "village nets" at lower cost. The project was in three steps. The first involved four pilot study seminars to find out the needs of village communities and to locate "white spots" where the market won't roll out broadband within 3-5 years. Step 2 produced information and presentation materials with partner organisations - the national farmers organisation, the Swedish Urban Network - on how villages can build their own networks. Thirdly, 13 "inspirational seminars" in community centres showed how to do it including funding. About 450 villagers and local administrators attended 17 seminars and related 150 workshops. From this, several villages and network companies have started to plan for an expansion of the broadband network in rural areas. About 40 follow-up projects were initiated in communities during 2009-2010 to put the ideas into practice. This has opened the eyes of public administrators who have produced a report to promote good practice in village community projects. Village connections are becoming real. The experience has been very positive about raising awareness not only of the possibilities for broadband in rural areas but other types of community development through "self-help" and partnership initiatives. This includes ordinary residents, public administrators, interest groups and the private sector - it was notable that even public employees were not aware of the breadth of possibilities and how they might be achieved. This is a project with national coverage in Sweden.